I was so excited when I opened up my huge package from Bridgewater Candle Company that was filled with their new scents of candles for my review. I got the cookie jar, frosted berry, and silent night candles. They all smell amazing!! I cannot wait to light these candles when it gets a little bit cooler out. Also, For every jar candle sold, Bridgewater donates money to feed one orphaned child for one day. 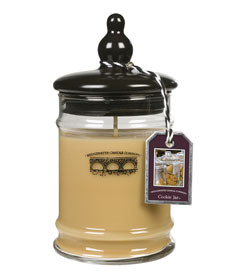 "Bridgewater Candle Company offers everyday hospitality through fun, friendly, comfort fragrances. From fresh and clean to warm and cozy, these scents create those special moments in life worth savoring. Furthermore, we are committed to sharing this warmth and hospitality with the world because we believe that everyday matters to everyone. In June 2010, Bridgewater launched our Light a Candle • Feed a Child™ campaign. Through a partnership with Rice Bowls™, Bridgewater donates a portion of each jar candle sale to different orphanages around the world. One jar feeds one child for one day. Everyday. Bridgewater jar candles are known for their clean burn. Our natural soy blend wax is formulated for maximum fragrance, long burn times and a safe, clean burn." I really like these candles and am very excited to do a giveaway for them. The giveaway will be for THREE 17.5 ounce candles in the scents Cookie Jar, Silent Night, and Frosted Berry (a $60 value!!). The giveaway is open until Midnight on Saturday October 2nd. Winner will be chosen on Sunday October 3rd using Random.org. Mandatory:Visit the Bridgewater Candle Company website and let me know which scent that you would most like to have! I know I'd love the Grapefruit Splash! I entered your lip balm giveaway. Im a new follower...and this sounds like a really amazing giveaway!! I added your button to my blog roll! I entered your Bambola giveaway. I also entered the oak ridge candle giveaway! Ohhh the Apple Pie sounds great!!! I would like the Cinnamon Vanilla candle! I entered the ShaToBu shaper giveaway. I would like to try the Bouquest of Roses! I entered the Bambola Skincare giveaway! I entered the Oh Wow Lip Balm giveaway. I entered the Oak Ridge Candle giveaway. I entered the Snapware Containers giveaway. I'm going to say blue door just because I have no idea what that would smell like. I have a button for your blog on mine, top left. Lily of the Valley would be my favorite scent. I would choose Caramel Apples. Yum! I entered your Oh Wow! Lip Balm Giveaway. I would like the Autumn Avenue. I would choose Bridgewater fragrance. I would love to try the Autumn Avenue scent! I'd like to have the Bouquet of Roses Scent! I am entering the Oh Wow lip balm giveaway! I like Pineapple Tangerine, IslandDelight, &Red Apple. I would like Orange Vanilla scent. Following your blog.Would love the Bouquet of roses. entered your Bambola Beauty giveaway. entered the Yurbuds Headphones giveaway. I subscribe to your blog through GFC! I'd love to try Caramel Apples. I've entered the Yurbuds giveaway.